Imam Hamza Yusuf, sometime khatib at the Muslim Community Association of Santa Clara, California, spoke on Sufism in Islam, directly following a lecture by Dr. Anne-Marie Schimmel, former Harvard professor of Oriental Studies. Imam Hamza began by noting that the architecture of Stanford is modeled after traditionalAndalusian, Moroccan and North African universities. He said that Islamic architecture and civilization was once great as was its scholarship, but unfortunately the Muslim ummah has fallen behind in these spheres. "The fundamental and underlying message in the tradition of Islam I think personally is that it does not and refuses to create this dialectic in which a person's inward and their outward become split. [In non-Islamic systems] people are either forced to become esoterists or they are forced to become exoterists. 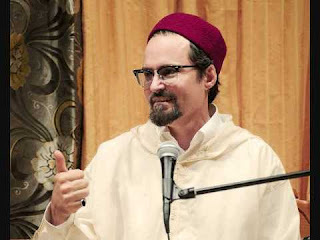 "In fact what Islam is trying to do and what most of the other spiritual religions and in fact from the Muslim perspective all of them have failed to do is to join these two elements in a harmonious and balanced way and this is why in the tradition of Islam Sufism has always been part of the traditional Islamic curriculum in every single Muslim university. I know of no period in the Islamic tradition in which Sufism was not taught in the universities and not seen as an important and fundamental aspect of the tradition of Islam. "Sidi Ahmad Zarruq wrote a great book called the principles of Sufism in which he clarified traditional and orthodox Sufism says in his principle number 208, 'there are five reasons for repudiating the Sufis the first of these is with reference to the perfection of their path. For if the Sufis latch on to a special dispensation or if they misbehave or are negligent in a matter or if a fault manifests itself in them, people hasten to repudiate them.' Because they are people who have traditionally been the most strongest and fierce adherents to the sacred teaching of Islam and they have been the ones also that have never inclined toward easy ways out on terms of the shariah or the sacred law. "The third reason [to reject the Sufis] is the existence of many who fall short of their claims and those who seek [worldly] gain through the guise of religiosity. This has been an affliction within the Muslim ummah. It is well known of the people claiming to be Sufis, putting on the garments of Sufis, and tricking simple followers and worshippers; getting them to give them their money, to slavishly serve them, and these type of things. This has happened historically in the Muslim world. The [pious] imams have always been the strictest at trying to prevent this deception, because there is nothing worse than deceiving somebody in religion. Give me a mafia gangster any day over a fraudulent religious observer--really! This is the reason for denying any claim that they might make even though there is proof of it. Because it is found doubtful. "The fourth reason is fear for the generality that they might be lead astray by following esoteric doctrines without upholding the letter of the law as happens to many ignorant people. So ignorant people might hear some statement which is said by a Sufi and they completely misunderstand it. And Abu Yazid al-Bistami put in ImamDhahabi's tabaqat is considered a faqih (jurisprudent). Imam Dhahabi is considered a student of Ibn Taymiyyaand he considers Abu Yazid al-Bistami a reasonable and sound source of hadith. Yet Abu Yazid al-Bistami is the one who is noted for saying 'Subhanee' which means 'Glory to Me!' This is known in the technical vocabulary of the Sufis as a shatha, an ecstatic utterance. If a person says it in a state in which their self is absent they are not taken to account for it We have proof of it in Sahih Bukhari about a slave in the middle of a desert in which the Prophet (s) says that because he finds his lost beast he shouts out in joy 'Allah you are my slave and I am Your lord!' The Prophet explained that that slave made a mistake in his ecstatic state after finding his animal. This is someone who finds their animal, so how much greater for someone who has found his Lord?! What about his state of ecstasy? "The fifth reason [to reject Sufism] is the covetousness some people have for the ranks of Sufism. In traditional Muslim society the Sufis were held up as literally the highest people in the society; they were the shaykhs. Imam Nawawi was a great Sufi, [Qadi] Iyad was a great Sufi, Ibn Hajar Asqalani was a great Sufi,Imam Ibn Jawzi was a great Sufi. All of these great imams were known to be Sufis of great stature. Abu Hamidal Ghazzali who is given the title Hujjat al-Islam is probably the greatest example. People wanted to be like them, and the Arabs are notorious in their understanding if you are not like noble people pretend to be like them because even that is a type of nobility. wa ala alihi wa sahbihi wa sallim tasliman kathira"
and may he be given safety and much salaam. "I would like to thank on behalf of CAIR and the Muslims in this area everybody for attending this lecture. Thank you very much." The following are some notes from the famous Sufism Internet Debate of 1993, which refer to the discussion of the concept of fana' which was mentioned by Shaykh Hamza above as the state in which some Sufi masters issued utterances (shatha) of outwardly anti-Islamic import. In Book, Volume 2, pages 396-397 of Majmu'a Fatawa, Shaikh al-Islam Ibn Taymiyya speaks about fana also known in Sufism as annihilation. "This state of love is the state of many people that are from the people of Love to Allah `azza wa jall, they are the people of the love of Allah and the People of the Will (al-irada) of Allah, it is typical of many of the people that love God and seek Him. Because that person has vanished in his lover, in Allah `azza wa jall ?hrough the intensity of the love, because he vanished in Allah's love, not his own ego's love. And he will recall Allah, not recalling himself, remember Allah , not remembering himself, visualizing Allah [yastashhid], not visualizing himself, existing in Allah, not in the existence of himself. When he reaches that state 'Ana al-Haqq' (I am the Truth) or 'Subhanee' (Glory to Me!) and he will say 'maa fil jubba ill-Allah' (there is nothing in this cloak except Allah), because he is drunk in the love of God and this is a pleasure and happiness that he cannot control." "Rabbana laa tu`akhidhna in-naseena aw akhta`na"
"And Allah says in other verse, "wa laa junaaha `alaykum fimaa akhtaatum bihi" - "there is no blame on you if you unintentionally do a mistake." "there is a story of two men who were so respectful and loved each other very much. One of them fell in the water [of the sea] and immediately the other threw himself behind him. Then the first one, who was sinking asked, "what made you throw yourself here?" He said, I vanished in you, and when I vanished in you I thought you were me and I was you." "As long as he is not through something that is prohibited, it is accepted, but if it were prohibited (the intention was bad then he is not excused." "And because of that [situation]many of the saints like `Abdul Qadir Jilani, have an excuse because they are in a state of love `ishq)." That subject is also mentioned in a whole chapter on detail from page 337-343, entitled: "al-Fana' alladheeyujad fi kalam as-sufiyya yuffassar bi-thalathat umur" (The Word Annihilation found in Sufism explained in Three Ways). This chapter describes the concept of fana' in detail.